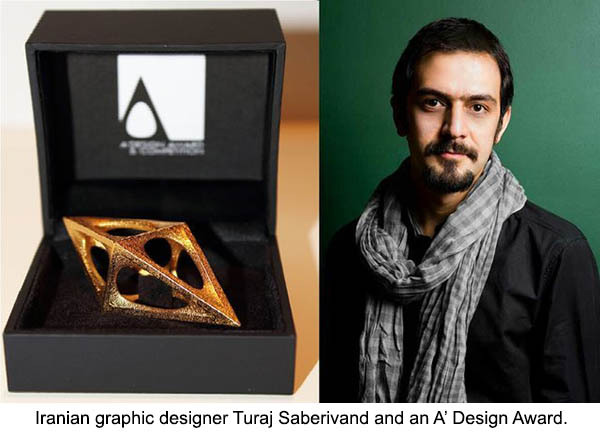 TEHRAN - Iranian graphic designer Turaj Saberivand has returned the A' Design Award that he won at an Italian contest in May after he failed to get a visa for Italy to attend the award ceremony of the event due to disrespect in the visa section of the Italian Embassy in Tehran. The organizers of the A' Design Award and Competition biennial, which is held in the Italian city of Milan, had sent the award to Saberivand through the mail, but he sent the award back to the Italian Embassy in Tehran "as a sign of protest" against "the disrespectful process" of granting a visa at the embassy, the Persian service of ISNA reported on Sunday. In an article earlier published by the Persian daily Sharq, Saberivand also wrote that the Italian Embassy in Tehran on its bulletin board has asked visa applicants to register online. "My frequent references to the embassy's website to register were in vain and the only practical way to get a visa was to enter into talks with agents who acted as intermediaries between visa applicants and the embassy," Saberivand said. He added that mismanagement at the embassy has resulted in "the illegal and disrespectful phenomenon" that "refutes diplomatic principles." Saberivand won the A' Design Award in the Graphics and Visual Communication Design Category for a logo that he designed for the tenth edition of the International Brand Conference Corporate Identity in Iran.